This chromolithograph is taken from plate 8 of William Simpson's 'India: Ancient and Modern'. The shawl was the Kashmiri product most prized by Europeans. They were hand-woven on looms by men only. 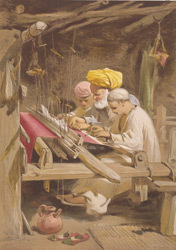 Here Simpson shows a master weaver at work with two boy apprentices at his side.